melt the butter on medium heat over the stove and add cheese soup. wisk until soup is less lumpy. add evaporated milk gradually while wisking until smooth. add 1/2 cup to 1 cup cheddar cheese gradually and continue to wisk as cheese melts. allow cheese to melt thoroughly before adding too much. you should have a thick velveeta-like cheese sauce that is a thick, yet pourable consistency with no lumps or stringiness. soften cream cheese and combine with the chicken and remaining cheddar. you could probably mash them together with a utensil, or with your hands. stuff the shells with your cream cheese chicken cheddar cheese mixture. 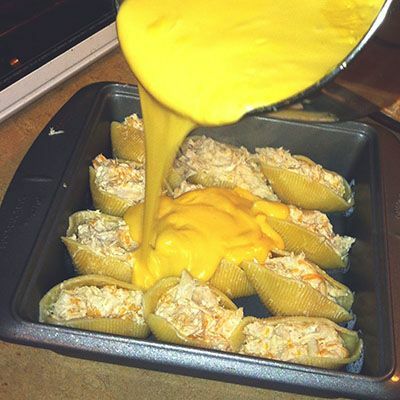 arrange stuffed shells in a greased pan and smother them in the cheese sauce. bake at 350 degrees for about a half hour.